We are proud to announce our new Public Enderfarm. When you walk into the farm, you will bump into the kill zone straight away. If there are players already, please wait your turn patiently. Make sure to share the farm as there's room for 2 and each side has it's own collection chest. - To prevent players from hogging the farm we have a flushing system in place. If you cross the netherbrick line on the sides of the killing area, you forfait your place and will have to wait back in line if you want to use it again. That way other players have a chance of using it too. 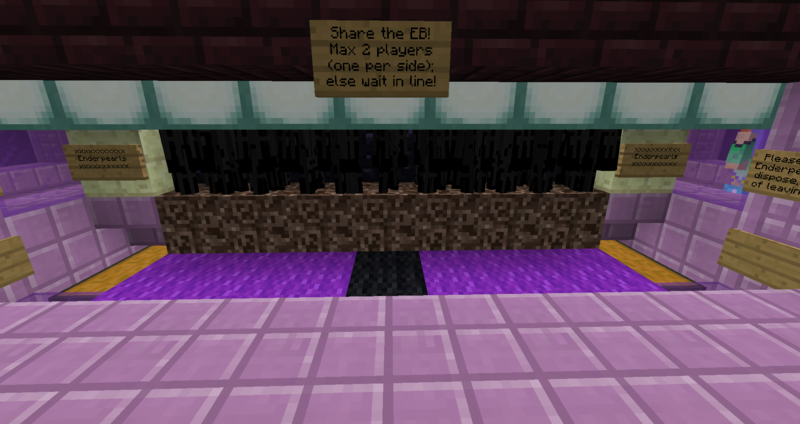 - If you look at the endermen, behind you is a [Disposal] sign. Please deposit excess pearls in there and then close the gui to have them deleted. Do NOT put valuable stuff in there, but if you do, you will be able to fix your error as long as you keep the GUI open. - If you walk to the back of the farm you will find an exit portal which bring you back to your spawn place (bed or region pole) or a warp sign to bring you back to the cathedral in Central. * /sell hand is currently not available to dispose of ender pearls. We will let you know when this changes. 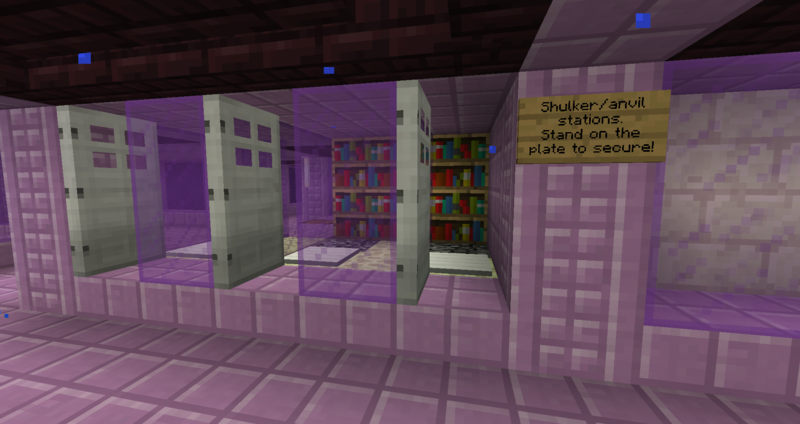 If you go around the killing area to the back, you will find 3 Anvil/Shulker stations there that are secured with a door and an enchantment room between. PLEASE bring your own anvils, lapiz, books, etc if you want to use the accomodations we provide. *Using these accomodations means you left the killing area and other players might have taken your place. No need to hold on to a killing spot while not actively using it. Players who are rude, abusive, leave enderpearls laying around, and doing anything else that they may make for an unpleasant experience for anyone else who visits the farm, will have their privileges curtailed or revoked entirely. Complaining about the set-up has no use. The way it's set up allows for players to not have to travel back home, it's just giving up a spot for the rest in line. If only 1 of no other players are waiting/using the farm, you're free to resume your spot.